Roma issue is difficult, not only in Ukraine. In fact, similar problems exist in all countries of the former Soviet Union, whether they entered the EU or not. The main problems of the Roma are similar in all countries: social isolation from the local population, low educational level, poor living conditions, total poverty, appalling living conditions, poor health and lack of representatives in government, household racism, lack of protection of the law enforcement agencies. During the work of our Fund, we concluded that the complexity of the processes of the social integration of Roma lies in two interrelated dimensions. Social and territorial isolation of Roma restricts access to information and resources that would contribute to the development of their inclusion in society. Without access to information about their rights, Roma remain illiterate and passive population of our country, which leads to sustainable preservation of customary law within the community and keeps stable isolation from the outside world. The lack of information about their rights and opportunities prevents the development of Roma communities: customary law, gender inequality, low educational level, limited access to health services in Roma community. Alienation and closeness of the community, lack of their representation on the public arena, stereotyping and stigmatization are the reasons for the existence of such shameful phenomena for a democratic country as Anti-Roma attitude, discrimination and hate speech. To break this vicious circle we are working simultaneously in two directions. We conduct educational work with Roma and provide free legal aid, with the goal to strengthen the legal opportunities and access for Roma to resources of the city, region and country. 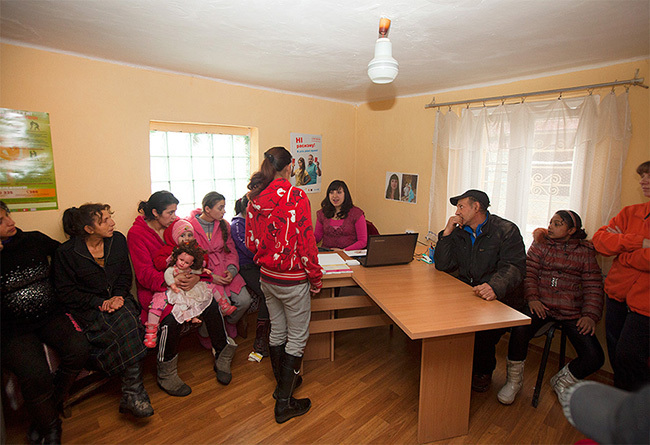 However, to reduce the social distance between Roma and other residents of Ukraine we are gradually implementing an advocacy campaign “Open Roma” – we open Roma settlements. If Ukraine claims to be a democratic European country and its citizens are worth to live in democracy, we must walk the same way: all efforts should be directed on help for Roma to destroy the isolation, which exist for ages, teach them to live by the laws and regulations of our common state and finally help them integrate into Ukrainian society, as it has done by the other nationalities, which live in Ukraine. Of course, integration is a long and complicated process. But if every day we make steps, small and invisible to others, then in a few years we can go through a long way to peaceful coexistence.